NIST Fire Research Division engineers use an abandoned New York City brick high-rise as a seven-story fire laboratory to better understand the fastmoving spread of wind-driven flames, smoke and toxic gases through corridors and stairways of burning buildings. The Group enables advances in fire fighter safety, fire ground operations, and effectiveness of the fire service; develops and applies technology, measurements and standards, and improves the understanding of the behavior, prevention and control of fires to enhance fire fighting operations and equipment, fire suppression, fire investigations, and disaster response. This website has been developed specifically for fire service users to aid them in getting the information that they can use and in a format that can be shared. 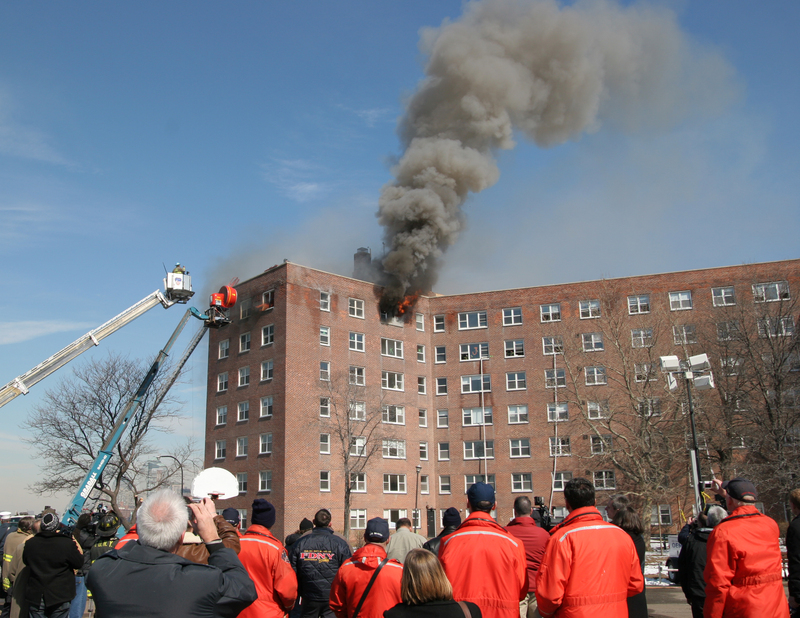 Since April of 2000, NIST has distributed hundreds of thousands of videotapes, CDs and DVDs as a means to transfer technology to the fire service, addressing fire phenomena, such as flashover, computer simulations of firefighter line of duty deaths, and new tactics to address the use of PPV in high rises and the use of flow path control techniques and exterior suppression for wind driven fire conditions. In order to improve the sharing of information and make better use of our digital resources, we are adding more features to the webpage. Over the course of the upcoming year, videos and PowerPoint© presentations will be added to each of the research area pages to provide materials that can be downloaded and modified as needed to suit your department's training needs. This will also speed access to the material. In addition, links to webinars, on-line training, and other significant resources supported by organizations with which NIST collaborates will be provided on the appropriate research area page. Information will also be posted that describes the capabilities and limitations of protective clothing and safety equipment and the research supporting the development of standards for those items. For more information, see the full list of Fire Fighting Technology Projects underway at NIST.